Franz Berwald’s reputation rests largely on the four symphonies that he composed in the first half of the 1840s, and more particularly on the highly original and aptly named Sinfonie singulière. The chamber music, with the possible exception of the Grand Septet of 1828, maintains a more peripheral hold on the repertory and is rarely encountered in the concert hall outside the composer’s native Sweden. Berwald did not really come into his own until the present century, one of his earliest champions being Wilhelm Stenhammar. But why, it may be asked, did his music make so little headway either in Sweden or, for that matter, anywhere else, and why was he cold-shouldered by the Swedish musical establishment of his day? First, he left Stockholm at important periods of his career and so was not on hand to press the claims of his music; secondly, in his dealings with others Berwald was far from being his own best friend (Mendelssohn met him in Berlin early in the 1830s and found him arrogant, and no doubt his demeanour played a part in ensuring his neglect); and thirdly, the few works of his that were played in Sweden in the 1840s were largely uncharacteristic and many of the performances poorly prepared. Stockholm heard two operettas, Modehandlerskan (‘The modiste’) and Jag går i kloster (‘I enter a convent’), and a couple of cantatas during the 1840s, and the picture derived from these works is very different to the one posterity has formed from the four symphonies of the composer’s maturity. Berwald himself heard only one of these, the Sinfonie sérieuse, although he had, of course, seen performed the early A major symphony of 1821 (which survives in fragmentary form and is now recorded on Hyperion CDD22043). Although Berwald was born in Stockholm the family were of German stock, and the name has been traced back to Bärwalde in Der Neumarck, south of Stettin. Born in 1796, a year before Schubert, he died the same year as Rossini and a year before Berlioz. As a sixteen-year old, Franz joined his father in the Royal Swedish Opera. He had already shown considerable creative prowess as well as a many-faceted and resourceful intelligence. By 1818 it had become obvious to him that he should try his fortune as what we would today call a ‘free-lance’ composer and performer. He undertook a tour with his violinist brother Christian to Helsinki and St Petersburg, and began publishing a Journal de musique to further disseminate his music. As with so many nineteenth-century composers, circumstances forced Berwald to pursue a dual career, spending many years on non-musical projects. When he moved to Berlin in his thirties and made little headway in the musical world, he founded an orthopaedic institute, based on the most highly developed techniques and largely following the principles of Ling. Some of the apparatus that he himself devised for the treatment of patients was in all essentials still in use as a basis for therapy well into the 1900s—all the more remarkable since Berwald had no scientific training and, indeed, precious little formal education of any kind. In the 1840s he returned to Sweden but again failed to make headway in the musical world. By the 1850s he had given up hope of advancement in the Swedish musical establishment, having been passed over for two posts to which he felt his talents entitled him—conductor of the Opera Orchestra and Director of Music at Uppsala University. Berwald turned to another non-musical activity, moving to the north of Sweden each summer as manager of a saw mill and a glass works. He even briefly ran a tile-and-brick factory, and his pen was in constant use as a polemicist on a wide variety of social issues, showing a progressive vision and sympathy. The first of the chamber works in this set, the Quartet in E flat for piano and wind (clarinet, bassoon and horn) dates from 1819, when Berwald was in his mid-twenties. By this time he had already composed the 1817 Septet, two string quartets (the second of which does not survive), a set of variations for two violins, and a number of keyboard pieces which he published himself in his Journal de musique. Composed in the received idiom of the day and indebted to Hummel, Weber and Spohr, the Piano Quartet in E flat breaks no new moulds. It follows the usual formal conventions—the outer movements are in sonata form and the middle movement is in a simple lied form. At the same time there are some signs of individuality, and a lively intelligence and wit shine through. Though not a major part of the Berwald canon, it remains a worthwhile contribution to the chamber music repertoire. During the 1850s Berwald composed a number of chamber works with piano, largely because of his interest in the pianist, Hilda Thegerström. It was with her in mind that he wrote his two piano quintets and the Piano Concerto. In all he composed five piano trios, four of which are numbered. The first in C major dates from 1845 and the first numbered essay in the genre, a Trio in E flat was composed four years later. The Piano Trio No 2 in F minor comes from 1851 and the autograph score is dated 3 March. The piece is dedicated to Matthäus von Rosthorn, an Austrian businessman in whose home at Oed bei Wien the Berwalds had stayed at the time of their son Hjalmar’s birth. It is basically a three-movement piece played without a break. After the last movement, which Berwald calls a Scherzo, he returns us to the material of the opening in a short coda of some sixty-five bars. The writing is full of original touches and rhythmic vitality, and the placid Mendelssohnian surface is disturbed by all sorts of characteristically Berwaldian flourishes and, in the theme of the slow movement, a sudden and unexpected modulation down a semitone from F to E major. The Swedish historian Ingvar Andersson speaks in his two-volume study of ‘the wine which Berwald’s music offers us: at its finest moments, dry, elegant and of great finesse’—and on hearing the F minor Trio, one is tempted to add sparkle. Of course Berwald’s best and most characteristic music comes from the 1840s, immediately after his marriage and the successes he enjoyed in Vienna, but two early works stand out for their originality. First, the String Quartet in G minor of 1818 with its inventive resource and modulatory audacities, and then the Grand Septet in B flat (1828). In the early years of the nineteenth century, Beethoven’s Septet was often played in Stockholm—and pretty well everywhere else for that matter. Like Hummel and Kreutzer, Berwald chose the same combination—clarinet, horn, bassoon, violin, viola, cello and double-bass—for his first essay in this form, written in 1817. No autograph of the 1817 Septet survives and the work we know comes from 1828. At the time Berwald spoke of it as a new work but it would seem more likely to be a re-working of the earlier piece. Sten Broman believed the two were different pieces but since, in a letter from Berlin to his sisters in 1831 discussing his early works, Berwald refers to the Septet, I incline to the view that it was a revision. Whether or not this is the case, the Septet is among his most delightful pieces. Formally it is innovative and anticipates the Sinfonie singulière (1845), enfolding the scherzo into the slow movement so that the middle movement functions both as a slow movement and as a scherzo. This has relatively few precedents, though Carl Philipp Emmanuel Bach adopted the practice in his C minor Klavier Concerto, Wq43 No 4. Later on in his String Quartet in E flat of 1849, Berwald takes this a stage further by putting the slow movement, complete with its scherzo enclosed, inside the main body of the first movement so that the whole piece is like a Chinese box. In its musical language we are in the tradition of Spohr and Kreutzer: inventive, urbane and attractive. In the finale there are occasional touches that even foreshadow the highly individual fingerprints of the Berwald of the 1840s. As his orchestral works went unplayed, Berwald turned naturally to chamber music. The Piano Quintet No 1 in C minor was completed in December 1853 and was among a number of chamber works with piano that were inspired by his talented young protégé, Hilda Thegerström (the dedicatee of both this quintet and the piano concerto written two years later). Although she played it in private, the first public performance, as we have already noted, did not take place for a further forty years, though the work was published in 1856. 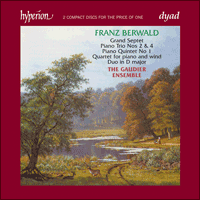 Berwald’s first attempt at a piano quintet had, in all probability, come in the late 1840s or early 1850s. A fragment from a quintet in A major, comprising a larghetto and scherzo, survives, and from this autograph all of the first movement has been torn except for the last few bars which are the same as those of the corresponding movement of the second quintet (1857). Berwald was an inveterate self-borrower and the finale of the C minor quintet includes material from the symphonic poem Wettlauf (‘Racing’) of 1842. As was the case in earlier works such as the Septet and the Sinfonie singulière Berwald makes use of an innovative formal device and incorporates a scherzo into the body of the opening allegro movement, furthermore quoting its theme again in the finale. The Duo in D major for violin and piano is one of Berwald’s most neglected pieces. Like the companion Duo in B flat for cello and piano it was written in the latter part of the 1850s; Berwald specialists favour 1858 as its probable date. There are three movements separated only by short pauses, the centre-piece being an Andante, or Romance, in F sharp minor which is folk-like in character and leads into a high-spirited finale. This eventually returns to the main theme of the Romance movement. Two years ealier Berwald had composed the third and best known of his piano trios (there are five in all). The first, like the trio recorded here, is in C major, and is unnumbered. It dates from 1845, the same year as the Sinfonie singulière and the Symphony No 4 in E flat. The remaining trios were composed in relatively rapid succession: No 1 in E flat in 1849, No 2 in F minor in March 1851, and No 3 in December the same year. The Piano Trio No 4 in C major was composed in 1853, the same year as the C minor Quintet. Like all its companions, save for the F minor Trio, it is in three movements. In 1867 Berwald offered the score without success to the Leipzig publisher Schuberth, who had published its three predecessors, and his widow later tried to interest the same house in this and a number of his other unpublished scores, but the work had to wait until 1896 when a Copenhagen publisher brought it out. La réputation de Franz Berwald repose surtout sur les quatre symphonies composées dans la première moitié des années 1840, et plus particulièrement sur la bien nommée Sinfonie singulière, originale à l’extrême. Mais, à l’exception possible du Grand septuor de 1828, la musique de chambre berwaldienne conserve une emprise plus périphérique sur le répertoire et demeure rare dans les salles de concert, en dehors de la Suède natale du compositeur. Berwald ne fut pas véritablement reconnu avant le XXe siècle, et Wilhelm Stenhammar fut un de ses tout premiers défenseurs. Mais pourquoi sa musique fit-elle si peu de chemin en Suède, comme partout ailleurs en fait, et pourquoi fut-elle battue à froid par la haute société musicale suédoise de son temps? Primo, Berwald quitta Stockholm à des périodes importantes de sa carrière et ne fut donc pas là pour appuyer les prétentions de sa musique; secundo, il fut loin d’être son meilleur allié dans ses rapports avec autrui (Mendelssohn, qui le rencontra à Berlin au début des années 1830, le trouva arrogant, et il ne fait aucun doute que son comportement contribua à son oubli); enfin, ses rares œuvres jouées en Suède dans les années 1840 étaient en grande partie atypiques, souvent desservies par des exécutions piètrement préparées. Outre deux cantates, le Stockholm des années 1840 entendit deux opérettes, Modehandlerskan («La modiste») et Jag går i kloster («J’entre au cloître»), et le tableau qui s’en dégage est tout à fait différent de celui que la postérité brossa à partir des quatre symphonies de la maturité du compositeur. Berwald lui-même n’entendit qu’une seule de ces pièces, la Sinfonie sérieuse, bien qu’il eût, naturellement, vu jouer une symphonie de ses débuts, celle en la majeur de 1821 (qui survit à l’état fragmentaire et est désormais enregistrée sur le CD Hyperion CDD22043). Bien qu’originaire de Stockholm, Berwald était issu d’une famille de souche allemande et l’on a pu faire remonter son nom à Bärwalde in Der Neumarck, au sud de Stettin. Né en 1796, un an avant Schubert, il mourut la même année que Rossini et un an avant Berlioz. À seize ans, il rejoignit son père à l’Opéra royal suédois. Il avait alors déjà fait montre de considérables prouesses créatives et d’une intelligence aux facettes multiples, pleine de ressources. En 1818, tenter sa chance comme compositeur-interprète «free-lance» lui était devenu une évidence. Il entreprit une tournée avec son frère violoniste Christian, à Helsinki et à Saint-Pétersbourg, et commença à publier un Journal de musique pour mieux disséminer sa musique. Comme tant de compositeurs du XIXe siècle, Berwald fut contraint à une double carrière, avec de nombreuses années consacrées à des projets non musicaux. Vers trente ans, il déménagea à Berlin mais, évoluant peu dans le monde musical, il créa un institut orthopédique fondé sur les techniques les plus avancées et largement fidèle aux principes de Ling. Certains des appareils qu’il conçut lui-même pour traiter ses patients servaient encore de base thérapeutique au début de ce siècle—fait d’autant plus remarquable que Berwald n’avait aucune formation scientifique et, en fait, très peu d’éducation tout court. Dans les années 1840, il rentra en Suède mais ne parvint pas à progresser dans le monde musical. Dans les années 1850, ayant abandonné tout espoir d’ascension dans la haute société musicale suédoise, après s’être vu refuser deux postes—chef de l’orchestre de l’opéra et directeur de musique à l’université d’Uppsala—, auxquels il pensait que ses talents lui donnaient droit, Berwald se tourna vers une nouvelle activité non musicale qui l’appela au nord de la Suède, chaque été, pour gérer une scierie et une verrerie. Il dirigea méme brièvement une tuilerie-briqueterie. Enfin, il usa constamment de sa plume pour écrire sur un large éventail de questions sociales, en polémiste animé d’une vision et de sentiments progressistes. La première œuvre de chambre du présent enregistrement, le Quatuor en mi bémol pour piano et vents (clarinette, basson et cor), date de 1819, des vingt ans passés de Berwald. À cette époque, il avait déjà composé le Septuor (1817), deux quatuors à cordes—le second n’ayant pas survécu—, plus un ensemble de variations pour deux violons et un certain nombre de pièces pour clavier, publiées dans son Journal de musique. Composé dans le style du moment et redevable à Hummel, Weber et Spohr, le Quatuor pour piano en mi bémol ne sort pas des sentiers battus et suit les habituelles conventions formelles—les mouvements extrêmes sont de forme sonate tandis que le mouvement central est de simple forme lied. Parallèlement, l’œuvre présente certains signes d’individualité, qui laissent transparaître une intelligence et un esprit vifs. Bien que ne constituant pas une élément majeur du canon de Berwald, cette pièce demeure une contribution louable au répertoire de la musique de chambre. Dans la décennie 1850, Berwald composa un certain nombre d’œuvres de chambre avec piano, en grande partie par intérêt pour la pianiste Hilda Thegerström. Ce fut en l’ayant présente à l’esprit qu’il écrivit ses deux quintettes avec piano et son Concerto pour piano. Au total, il composa cinq trios pour piano et cordes, dont quatre sont numérotés. Le premier, en ut majeur, remonte à 1845, tandis que le premier essai numéroté dans ce genre, un Trio en mi bémol, vit le jour quatre ans plus tard. Le Trio pour piano et cordes no2 en fa mineur date de 1851, précisément du 3 mars selon l’autographe. Ce morceau est dédié à Matthäus von Rosthorn, un homme d’affaires autrichien dans la maison duquel les Berwald avaient séjourné (à Oed bei Wien) au moment de la naissance de leur fils Hjalmar. Il s’agit fondamentalement d’une pièce à trois mouvements jouée sans pause. Après le dernier mouvement, que Berwald appelle Scherzo, l’œuvre reprend le matériel initial dans une courte coda de quelque soixante-cinq mesures. L’écriture regorge de touches originales, de vitalité rythmique; la tranquille surface mendelssohnienne est troublée par toutes sortes de fioritures typiquement berwaldiennes et, dans le thème du mouvement lent, une modulation des plus inattendues transpose le fa en mi majeur, un demi-ton plus bas. L’historien suédois Ingvar Andersson déclare, dans son étude en deux volumes: «le vin que nous offre la musique de Berwald est, à ses plus beaux moments, sec, élégant et d’une grande finesse»—et mousseux, serait-on tenté d’ajouter à l’écoute du Trio en fa mineur. La meilleure musique de Berwald, la plus caractéristique aussi, est bien sûr celle des années 1840, juste après son mariage et ses succès viennois. Deux de ses œuvres plus anciennes se détachent cependant par leur originalité: son Quatuor à cordes en sol mineur (1818), aux ressources inventives et aux modulations audacieuses, et son Grand Septuor en mi bémol (1828). Au tout début du XIXe siècle, le septuor de Beethoven était souvent joué à Stockholm, comme pratiquement partout ailleurs, au reste. À l’instar de Hummel et de Kreutzer, Berwald choisit la même combinaison—savoir clarinette, cor, basson, violon, alto, violoncelle et contrebasse—pour son premier essai dans cette forme, en 1817. Aucun autographe de cette œuvre ne nous est parvenu et le morceau que nous connaissons date de 1828. À l’époque, Berwald en parla comme d’une œuvre nouvelle mais il semblerait qu’elle soit plus probablement une réécriture de la pièce initiale. Certes, Sten Broman les considérait comme deux compositions distinctes, mais la lecture de la correspondance du compositeur m’invite à penser que la seconde fut une révision de la première. En effet, dans une lettre adressée de Berlin à ses sœurs, en 1831, Berwald évoquait son septuor comme une de ses premières œuvres. Quoi qu’il en soit, le septuor figure parmi ce qu’il écrivit de plus charmant. Novateur dans sa forme, il anticipe la Sinfonie singulière (1845), en ce qu’il étreint le scherzo dans le mouvement lent, faisant que le mouvement central fonctionne à la fois comme un mouvement lent et comme un scherzo. Bien que Carl Philipp Emmanuel Bach l’adoptât dans son Klavier Concerto en ut mineur, Wq43 no4, cette pratique connaît relativement peu d’antécédents. En 1849, Berwald ira plus loin et placera tout le mouvement lent, avec son scherzo enchâssé, dans le corps principal du premier mouvement de son Quatuor à cordes en mi bémol, donnant à cette œuvre l’apparence d’une boîte gigogne. Pour ce qui est du langage musical, le septuor se place dans la tradition de Spohr et Kreutzer, inventif, raffiné et attrayant. Le finale exhale même quelques touches qui préfigurent le sceau extrêmement particulier du Berwald des années 1840. Comme ses œuvres orchestrales restaient injouées, Berwald s’orienta naturellement vers la musique de chambre. Le Quintette pour piano et quatuor à cordes no1 en ut mineur, achevé en décembre 1853, fut une des œuvres de chambre avec piano que lui inspira sa jeune protégée, la talentueuse Hilda Thegerström (dédicataire de ce quintette et du Concerto pour piano écrit deux ans plus tard). Elle le joua en privé, mais la première exécution publique n’eut lieu, comme susmentionné, que quarante ans plus tard, bien que l’œuvre eût été publiée dès 1856. La première tentative berwaldienne de quintette avec piano datait, selon toute probabilité, de la fin des années 1840 ou du début des années 1850. Un fragment du Quintette en la majeur, comprenant un larghetto et un scherzo, survit, et cet autographe nous révèle que tout le premier mouvement a été déchiré, à l’exception des quelques dernières mesures, identiques à celles du mouvement correspondant du second quintette (1857). Berwald était un «auto-emprunteur» invétéré et le finale du quintette en ut mineur inclut un matériau tiré de son poème symphonique Wettlauf («Course»), de 1842. Comme dans certaines œuvres antérieures, telles le septuor et la ,i>Sinfonie singulière, Berwald utilise un procédé formel novateur et intègre un scherzo dans le corpus de l’allegro initial, en reprenant, en outre, son thème dans le finale. Cette œuvre est l’une des plus oubliées de Berwald. Comme son pendant, le duo en si bémol pour violoncelle et piano, elle fut écrite dans la dernière partie des années 1850, les spécialistes de Berwald privilégiant 1858 comme date probable de composition. Ce duo compte trois mouvements séparés seulement par de brèves pauses, le morceau central étant un Andante (ou Romance) en fa dièse mineur, de caractère populaire, qui conduit à un finale plein d’entrain, lequel reprend finalement le thème principal de la romance. Deux ans auparavant, Berwald avait composé le troisième, et le plus connu, de ses cinq trios pour piano et cordes. Le premier est en ut majeur, à l’instar de celui proposé ici. Non numéroté, il remonte à 1845, année de la Sinfonie singulière et de la Symphonie no4 en mi bémol. Les autres trios furent composés dans une succession relativement rapide: no1 en mi bémol en 1849, no2 en fa mineur en mars 1851 et no3 en décembre 1851. Le Trio avec piano no4 en ut majeur—écrit en 1853, la même année que le quintette en ut mineur—est en trois mouvements, comme tous les autres trios, à l’exception de celui en fa mineur. En 1867, Berwald proposa en vain la partition à l’éditeur Schuberth, de Leipzig, qui avait déjà publié les trois trios précédents; plus tard, sa veuve tenta à nouveau d’intéresser la maison Schuberth à cette partition et à un certain nombre d’œuvres inédites, mais le trio dut attendre 1896 pour qu’un éditeur de Copenhague la fît paraître. Franz Berwalds Renommee stützt sich größtenteils auf seine vier Sinfonien, die er zwischen 1840 und 1845 komponierte, insbesondere jedoch auf die Sinfonie singulière, welche überaus originell ist und ihren Namen zu recht trägt. Seine Kammermusik, mit Ausnahme des Grand Septet aus dem Jahre 1828, spielt nur eine Nebenrolle im Repertoire und ist, abgesehen von gelegentlichen Aufführungen in der schwedischen Heimat des Komponisten, nur äußerst selten in den Konzerthallen der Welt zu hören. Berwald, dessen musikalische Akzeptanz sich bis in dieses Jahrhundert hinauszögerte, fand in Wilhelm Stenhammar einen seiner ersten Anhänger und Förderer. Doch warum, so mag man sich fragen, war seine Musik sowohl in Schweden als auch andernorts so wenig erfolgreich, und warum wurde er vom musikalischen Establishment in Schweden so rigoros abgelehnt? Eine erste Erklärung dafür ist, daß er Stockholm in für seine Karriere bedeutsamen Momenten den Rücken zukehrte und folglich nicht zugegen war, um seine Musik dort durchzusetzen. Zweitens tat sich Berwald mit seiner Art des gesellschaftlichen Umgangs wohl kaum selbst einen Gefallen. (In Berlin machte Mendelssohn in den frühen 1830er Jahren die Bekanntschaft Berwalds, der bei ihm einen Eindruck von Arroganz hinterließ. Es läßt sich wohl zweifelsohne behaupten, daß Berwalds Auftreten mit zu seiner Nichtachtung beitrug.) Drittens waren jene wenigen Werke, die tatsächlich in den 1840er Jahren in Schweden aufgeführt wurden, größtenteils charakterschwach, und viele Aufführungen waren zudem schlecht vorbereitet. Auf Stockholms Bühnen wurden zwei Operetten inszeniert, Modehandlerskan („Die Modistin“) und Jag går i kloster („Ich geh’ ins Kloster“), sowie zwei Kantaten in den 1840er Jahren aufgeführt. Das Bild, das uns diese Werke bieten, steht jedoch in starkem Gegensatz zu jenem, das sich die Nachwelt auf der Grundlage der vier ausgereiften Sinfonien des Komponisten gemacht hat. Abgesehen von der frühen Sinfonie in A-Dur aus dem Jahre 1821 (die in ihrer unvollständigen Form erhalten und jetzt auf der Hyperion-CDD22043 zu hören ist) erlebte Berwald selbst nur eine Aufführung dieser Werke, nämlich die der Sinfonie sérieuse. Obwohl Berwald in Stockholm geboren wurde, war seine Familie deutscher Abstammung, und der Name läßt sich bis in die Neumarck, südlich von Stettin, wo er Bärwalde lautete, zurückverfolgen. Berwald wurde 1796, ein Jahr vor Schubert, geboren und verstarb im selben Jahr wie Rossini und ein Jahr vor Berlioz. Als Sechzehnjähriger trat Franz Berwald in die Fußstapfen seines Vaters und wurde Mitglied der Königlichen Schwedischen Oper. Er hatte bereits beachtliche kreative Kräfte an den Tag gelegt, sowie einen vielseitigen und einfallsreichen Geist. Gegen 1818 hatte er den Entschluß gefaßt, sein Glück als sogenannter „freiberuflicher“ Komponist und Interpret zu versuchen. Er begab sich zusammen mit seinem Bruder Christian, der Violinist war, auf eine Tournee nach Helsinki und St. Petersburg und begann mit der Herausgabe eines Journal de musique, zum Zwecke der weiteren Verbreitung seiner Musik. Wie viele andere Komponisten des 19. Jahrhunderts war auch Berwald aufgrund finanzieller Umstände gezwungen, beruflich zweigleisig zu fahren, und so verbrachte er viele Jahre mit Arbeiten an nicht-musikalischen Projekten. Im Alter von über dreißig Jahren zog Berwald nach Berlin, wo er sich jedoch nur begrenzt Zutritt zur Musikwelt zu verschaffen vermochte. Aufgrunddessen gründete er dort ein orthopädisches Institut, das über die hochentwickeltsten Technologien verfügte und sich die Ling-Prinzipien zu eigen gemacht hatte. Einige der von Berwald selbst entwickelten Vorrichtungen zur Krankenbehandlung waren im Prinzip noch Anfang dieses Jahrhunderts als Therapiegrundlage in Gebrauch. Dies ist umso bemerkenswerter, als Berwald keinerlei wissenschaftliche Kenntnisse besaß und so gut wie gar nicht in den Genuß einer höheren Schulbildung gekommen war. In den 1840er Jahren kehrte er nach Schweden zurück, doch auch dort blieb ihm der musikalische Erfolg versagt. In den 1850er Jahren wurde dann selbst sein letzter Funken Hoffnung auf einen Aufstieg im schwedischen Musikestablishment im Keim erstickt, da er bei der Bewerbung um zwei Posten, für die er sich aufgrund seines Talents geeignet glaubte—nämlich Dirigent des Opernorchesters und Musikdirektor an der Universität von Uppsala—, übergangen worden war. Berwald wandte sich daraufhin einer anderen nicht-musikalischen Tätigkeit zu und reiste jeden Sommer als Leiter einer Sägemühle und einer Glaserei in den Norden des Landes. Kurze Zeit leitete er sogar eine Fliesen- und Ziegelfabrik, und auch Feder und Tintenfaß, die er polemisch für eine Vielzahl gesellschaftlicher Themen nutzte, ruhten nicht und offenbarten fortschrittliches Denken und Mitgefühl. Das erste kammermusikalische Werk dieser CD, das Quartett für Klavier und Bläser in Es-dur (Klarinette, Fagott und Horn), stammt aus dem Jahr 1819, als er sich in seinen Zwanzigern befand. Bis zu diesem Zeitpunkt hatte er bereits das Septett (1817), zwei Streichquartette, von denen das zweite verlorengegangen ist, eine Reihe von Variationen für zwei Violinen und einige Stücke für Tasteninstrumente, die er in seinem Journal de musique selbst veröffentlichte, komponiert. Das Klavierquartett in Es, komponiert in damaliger Idiomatik, verdankt Hummel, Weber und Spohr viel und bricht kaum mit der Tradition. Es ist nach den gewöhnlichen formalen Konventionen aufgebaut—die äußeren Sätze erscheinen in Sonatenform und der mittlere Satz besteht aus einem einfachen Lied. Zur gleichen Zeit sind aber auch einige Anzeichen von Individualität vorhanden, und eine lebhafte Intelligenz und Witz kommen hier zum Vorschein. Obwohl es nicht eines der Hauptwerke des künstlerischen Schaffens Berwalds darstellt, ist es ein wertvoller Beitrag zum Repertoire der Kammermusik. Während der 1850er komponierte Berwald eine Reihe kammermusikalischer Stücke für Klavier, deren Entstehen im großen und ganzem seinem Interesse für die Pianistin Hilda Thegerström zu verdanken sind. An sie denkend, schrieb er seine beiden Klavierquintette und das Klavierkonzert. Er komponierte insgesamt fünf Klaviertrios, von denen vier nummeriert sind. Das erste in C-Dur geht in das Jahr 1845 zurück, und das erste nummerierte Werk dieses Genres, das Trio in Es, wurde vier Jahre später komponiert. Das Klaviertrio Nr. 2 in f-Moll wurde 1851 komponiert, und die handschriftliche Partitur ist mit dem 3. März datiert. Das Stück ist Matthäus von Rosthorn, einem österreichischen Geschäftsmann, gewidmet, in dessem Haus in Oed bei Wien sich die Berwalds zur Zeit der Geburt ihres Sohnes Hjalmar aufhielten. Im Grunde genommen ist es ein dreisätziges Stück ohne Unterbrechung. Nach dem letzten Satz, den Berwald ein Scherzo nennt, führt er uns mit einer Coda von ungefähr fünfundsechzig Takten zum einleitenden Material zurück. Die Partitur ist gespickt mit Originalität und rhythmischer Vitalität, während die friedvolle mendelssohnsche Oberfläche von charakteristisch berwaldschen Verzierungen aller Art gebrochen wird. In der Melodie des langsamen Satzes erscheint dann eine langsame und unerwartete Modulation um einen halben Ton nach unten, von F auf E-Dur. Der schwedische Historiker Ingvar Andersson spricht in seiner zweiteiligen Studie vom „Wein der berwaldschen Musik, die in ihren besten Momenten trocken, elegant und von größter Feinheit ist“—und beim Hören des Trios in f-Moll möchte man dem noch ein „perlend“ hinzufügen. Die beste und charakteristischste Musik Berwalds wurde natürlich in den 1840ern komponiert, unmittelbar nach seiner Heirat und den Erfolgen, die er in Wien feierte. Es gibt jedoch zwei frühe Werke, die wegen Ihrer Originalität auffallen. Das erste ist das Streichquartett in g-Moll von 1818, mit seinem Einfallsreichtum und seiner kühnen Modulation, das zweite das Grand Septett in B-dur (1828). In den ersten Jahren des neunzehnten Jahrhunderts wurde Beethovens Septett in Stockholm—und eigentlich überall—recht häufig gespielt. Wie Hummel und Kreutzer wählte Berwald 1817 für sein erstes Herantasten an diese Form die gleiche Besetzung—Klarinette, Horn, Fagott, Violine, Bratsche, Cello und Kontrabaß. Es ist uns von diesem 1817-Septett keine handschriftliche Partitur erhalten geblieben, und das Werk, das uns bekannt ist, stammt von 1828. Zu dieser Zeit beschrieb Berwald es als ein neues Werk, es ist aber eher anzunehmen, daß es eine Überarbeitung des früheren Stückes ist. Ob dieses nun der Fall ist oder nicht, so gehört das Septett doch zu seinen wunderbarsten Werken. Es ist von einem formalen Erfindungsreichtum und läßt die Sinfonie singulière (1845) vorausahnen, indem es das Scherzo zu einem langsamen Satz entwickelt, so daß der mittlere Satz sowohl als langsamer Satz als auch als Scherzo erscheint. Dies hatte relativ wenige kompositorische Vorbilder, obwohl Carl Philipp Emmanuel Bach diese Technik für sein Klavier Concerto in c-Moll, Wq43 Nr. 4 anwendete. Später, in seinem Streichquartett in Es von 1849, entwickelt Berwald diese Form noch weiter, indem er das Scherzo vollkommen in die Hauptstruktur des langsamen Satzes integriert, so daß das gesamte Stück einem Puzzle ähnelt. Im Bereich seines musikalischen Ausdrucks befinden wir uns ganz bei Spohr und Kreutzer, einfallsreich, gewandt und reizvoll. Das Finale hat zuweilen einen Hauch, der die höchst individuellen Merkmale des Berwald der 1840er ahnen läßt. Da seine Orchesterwerke ungespielt blieben, wandte sich Berwald nun der Kammermusik zu. Das Quintett für Klavier und Streichquartett Nr. 1 in c-Moll wurde im Dezember 1853 vollendet und zählte zu einer Reihe von Kammermusikwerken mit Piano, die von seinem jungen, talentierten Protegée Hilda Thegerström (der sowohl dieses Quintett als auch das zwei Jahre später geschriebene Klavierkonzert gewidmet sind) inspiriert wurden. Zwar spielte sie dieses Werk in privaten Kreisen, doch wie bereits angemerkt, ließ die erste öffentliche Aufführung noch weitere vierzig Jahre auf sich warten, und dies obwohl das Werk bereits 1856 herausgegeben worden war. Berwald hatte sich aller Wahrscheinlichkeit nach erstmals in den 1840er oder 1850er Jahren an der Komposition eines Klavierquintetts versucht. Erhalten geblieben ist ein Fragment des Quintetts in A-Dur, einschließlich eines Larghettos und Scherzos. Bis auf die Abschlußtakte, die übrigens mit jenen des entsprechenden Satzes des zweiten Quintetts (1857) identisch sind, fehlt diesem handgeschriebenen Manuskript der gesamte erste Satz. Berwald war ein unverbesserlicher Selbstentleiher, und das Finale des Quintetts in c-Moll weist Material aus dem sinfonischen Gedicht Wettlauf aus dem Jahre 1842 auf. Wie auch in früheren Werken wie dem Septett und der Sinfonie singulière macht Berwald hier von einer innovativen formalen Praktik Gebrauch und integriert ein Scherzo in den eröffnenden Allegro-Satz, worüber hinaus er das Scherzo-Thema erneut im Finale aufgreift. Das Duo in D-Dur für Violine und Klavier ist eines der am meisten vernachlässigten Berwald-Werke. Ebenso wie das Duo in B-Dur für Cello und Klavier wurde dieses Duo zwischen 1855 und 1860 komponiert; Berwald-Kenner geben 1858 als sein wahrscheinliches Entstehungsjahr an. Seine drei Sätze sind nur durch kurze Pausen voneinander getrennt. Der Mittelteil ist ein Andante oder eine Romanze in fis-Moll in volkstümlichem Charakter, der zu einem lebhaften Finale überleitet, welches schließlich zum Hauptthema des Romanzensatzes zurückkehrt. Zwei Jahre zuvor hatte Berwald das dritte und bekannteste seiner (insgesamt fünf) Klaviertrios geschrieben. Das erste, ebenso wie das hier zu hörende Trio, steht in C-Dur und ist nicht numeriert. Es stammt aus dem Jahre 1845, ebenso wie die Sinfonie singulière und die Sinfonie Nr. 4 in Es-Dur. Die restlichen Trios wurden in relativ schneller Aufeinanderfolge komponierte: Nr. 1 in Es-Dur im Jahre 1849, Nr. 2 in f-Moll im März 1851 und Nr. 3 im Dezember desselben Jahres. Das Klaviertrio Nr. 4 in C-Dur wurde 1853 geschrieben, ebenso wie das c-Moll-Quintett; wie alle anderen Trios, mit Ausnahme des f-Moll Werkes, besteht auch dieses aus drei Sätzen. Im Jahre 1867 bot Berwald dem Leipziger Verleger Schuberth, der bereits die drei Vorgänger veröffentlicht hatte, die Partitur an. Doch ohne Erfolg. Berwalds Witwe startete später den Versuch, das Interesse eben dieses Verlagshauses für jenes Stück sowie eine Reihe weiterer unveröffentlichter Partituren zu wecken, doch das Werk mußte noch bis 1896 auf seine dann endlich von einem Kopenhagener Verleger vorgenommene Herausgabe warten.